Coconut oil has many health benefits. But did you know there are also beauty benefits of using coconut oil-based products? Here are five of them. Coconut oil is a superior moisturizer, as it helps create smooth, soft skin without pore blockage. It’s actually good for your pores and may help reduce blackheads, whiteheads, and acne. Try using coconut oil on those troublesome wrinkle areas, such as under the eyes, around the nose and mouth, on the neck, and more. This can help reduce or prevent the appearance of baggy eyes and wrinkles when used regularly. Instead of spending a ton of money on solutions that don’t work, try using coconut oil to get rid of your dandruff. Apply it evenly to the scalp, at least once per day. 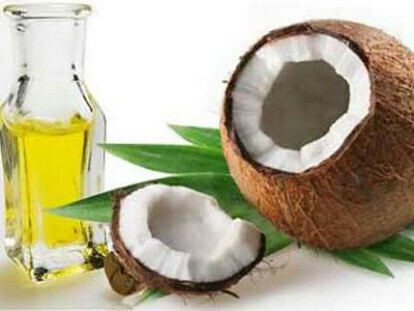 Coconut oil has natural properties that lift dirt, grease and grime away from the face. It’s also good for the skin. This makes it a great makeup remover. Keep your face looking clean and clear and wipe makeup away with ease. Did you know that coconut oil is a great lightweight oil to use when you need to seal split ends? It can help heal the hair over time. Every day people are bombarded with billboards, TV ads, magazine ads and more about products to make their skin look young. Many times, these products contain makeup. But what if you're like me and prefer to actually have younger-looking skin, not just compound the issue while trying to cover it up. Many types of makeup can actually be damaging to the skin. So while you are using it to cover minor issues, you may actually be making the situation worse. You truly can keep your skin looking young without makeup. Use natural moisturizers regularly. My favorite natural moisturizers for young-looking skin include tea tree oil, shea butter, cocoa butter, almond oil, vitamin E oil, and olive oil. I also like to make facial masks with these ingredients, as well as those from fresh fruits and vegetables. To make a deep skin moisturizer, mash one avocado and a banana half together. Stir in 1 teaspoon each of olive oil, almond oil, and vitamin E oil. Smooth over the face. Leave the mask on for thirty minutes and rinse away. This can also be used on other external areas of the body as well. Keep your pores clean. Clogged pores can make a face look dull and lifeless, which can make a person look older. Cleaning the pores regularly helps avoid this effect. I have a few methods that I like to use. For the first one, all you need is a lemon and a dry cloth. Slice the lemon in half. Cleanse you face with just warm water. Then, take one of the halves and rub the opened side around the face and neck in circular motions. You may also need to use the other half if you face if the lemon gets too oily. Now, take the cloth and wipe any excess from your face. Another method is to mix half apple cider vinegar and half pure (strained) lemon juice. Dip cotton balls in the mixture and rub it all over your face in circular motions. Let it air dry. Do this once per day. If you've been sweating or participating in a dirty or strenuous activity, you'll want to do it again. Eat the right foods. Diet can actually play a major role in the way a person's skin looks. Examine the foods you eat to find out which are good and which are not. Cut back on the foods that worsen skin conditions, such as acne and eczema. Add foods that enhance your overall health. Food rich in essential vitamins and minerals are excellent for the skin. Nuts, avocados, bananas, strawberries, eggs, and milk are just some of the many foods that I've used to help keep my skin looking healthy and young. Adapt a smarter beauty regimen. Only use products that work for your skin, not against it. Think about the ingredients. If something is poisonous, why would you want it on your skin? Just because you aren't going to eat it, doesn't mean it's any better to put it on your skin. If you want naturally young-looking skin, use natural ingredients. One note about natural ingredients is that not all natural ingredients are safe either. Always do the research before applying something to your skin. Some things may be poisonous, cause allergies, or have other adverse effects. Once you discover what works for you, stick to it. Maintenance is key to keeping your skin looking young. *Always consult an appropriately-licensed health professional when it comes to the care of your skin. Information herein is based on the author's own personal experiences and is not meant to substitute the care and advice of a licensed expert. I am often complimented on the smoothness of my face and at how youthful I look. Let me tell you that after 4 kids, that feels pretty good. So, what's my secret? Avoid makeup at all costs. I know what you're thinking. "What about my blemishes?" "What about my freckles?" "How can I cover up my uneven tones?" My answer to all those questions is simply "Don't you dare!" The more makeup and products you use to cover up your so-called beauty flaws is most likely doing you more harm than good. Instead of covering up, work on healing the ones that are a real issue and embracing the ones that are naturally you. Freckles become beauty marks. Uneven skin tones can be healed by applying things like shea butter and cocoa butter, which are very good for the skin overall. To rid acne, wash the face with a mild soap, like Dove Sensitive Skin. Pat dry and apply diluted tea tree oil. I like a mix with a base of olive oil (about 2 ounces) and 10 drops of pure tea tree oil. Do this twice per day to clear up the acne. This has been my regimen since I first broke out with acne badly. It rid me of the issue and as long as I keep with that regimen daily, it keeps the acne away. Tea tree oil and olive oil is good for the skin in general. Instead of using things that work against your beauty or cover up your natural beauty, go with natural products that maintain and enhance it. Don't cover it up! Refresh it!